I hadn’t been out to Gertrude’s Nose in many years, so I jumped at the opportunity to join Hudson Valley photographer Steve Aaron on a hike, and of course, Odie the Labradoodle was eager to come, too. In fact, when I hopped in the car to run an errand (I was going to come back and get him), Odie was so upset, he cried and howled. 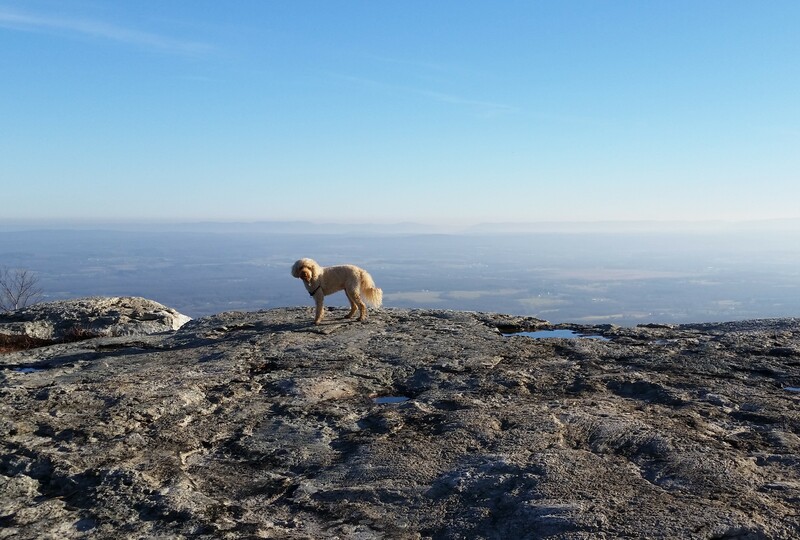 So Odie came with me on the errand, and then we headed off to Minnewaska State Park Preserve and the trail to Gertrude’s Nose. The Nose is a shelf of glacially-scoured Shawangunk conglomerate that juts off into space. With the December sun low in the sky, the Hudson Valley disappeared into the haze, and the rock shelf seemed to extend straight to the horizon. To the west, the Shawangunk Mountains fell away in a series of spurs, with Sam’s Point marking the furthest row of cliffs visible before the ridgeline seemingly dissolved into the air. But behind it, the ridge continues another forty miles into New Jersey, where it is called the Kittatinny Mountains, and it reaches further south into Pennsylvania and Virginia. I looked to the southeast, and with the sun streaming in from the side, the vast abstract spaces suddenly resolved into detail. Farms, lakes, buildings now stood out in relief on the valley plains almost 2,000 feet below. Odie and I hung around for a few minutes, absorbed in the vistas. For a brief moment, I might have been Emerson’s “transparent eyeball,” his metaphor for how a selfless observer experiences nature — but then it was time to head back. The feeling of light and space stayed with me, as we navigated the rugged footpath back to the car and then headed home to the city. The next morning, when I woke up, a sliver of dim grey light poked through a chink in the shutters. I thought about the morning commute through congested streets then pictured the office building where I’d spend all day inside, surrounded by tall buildings that block the sun. Come next weekend, you’ll find me back in the mountains. Standing on the bare ground, — my head bathed by the blithe air, and uplifted into infinite spaces, — all mean egotism vanishes. I become a transparent eye-ball; I am nothing; I see all; the currents of the Universal Being circulate through me; I am part or particle of God.